"Schneider's management of such technical elements as harmonic shading and thematic modulation is impeccable. Far more important is her gift for creating music identical with emotion. Only 54, she has lived long enough to look back on her life through time's fading light, and to have known change, including the passing of much that she loved. Music is her means of holding on to what would otherwise be lost. It is everyone's hope. If you are able to cry over a piece of music, The Thompson Fields will make you cry." 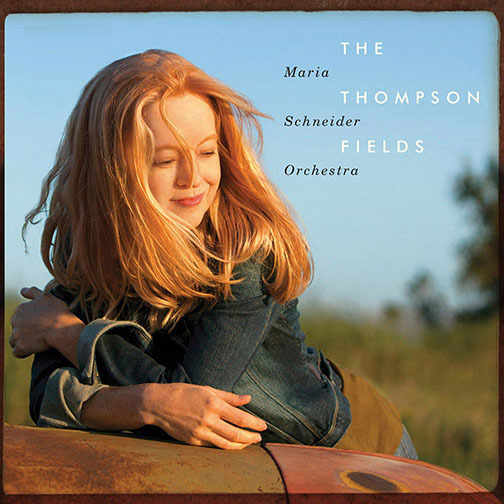 The Thompson Fields: ***** "...there is nobody more capable of harnessing emotions in music and projecting and preserving the beauty and power of the natural world in sound than Maria Schneider. She's demonstrated that time and again, and she does it once more on this awe-inspiring release." The Thompson Fields: "This marriage of sounds, words and images is ultimately breathtaking, a testament not simply to the hipness of jazz but to the uplifting and sustaining powers of art." "The Thompson Fields breaks through to a new level. It's her most ambitious recording, and her most accomplished; it places her in the pantheon of big-band composer-leaders, just below Ellington, Strayhorn, and Gil Evans at his very best; it's a masterpiece"
The Thompson Fields ***** (five stars) "Her latest album, some 10 years in the making, shows just what a supple and powerful instrument a jazz orchestra can be." The Thompson Fields: ***** (five stars) "...a sound-world of rare eloquence ... the singularly most beautiful record I've heard this year." "Maria Schneider is a national treasure." The Thompson Fields: "... a masterpiece ... Schneider's lovely themes are immediately accessible, but this is also music whose intricate arrangements reveal new discoveries on repeated listening." "The Thompson Fields is a testament to the ever-evolving talent of Maria Schneider." "The Thomson Fields may be her finest triumph in a stellar career as a jazz orchestra leader, composer/arranger and conceptualist. No one in jazz today, or at least in big band jazz, writes in such evocative fashion. Five stars - and then some." "The Maria Schneider Orchestra's ravishing new recording, The Thompson Fields, demonstrates her evolving vision for the evocative and deep nuances of sonic beauty that her music now radiates." "...when the artistic offerings competing for our entertainment dollars and attention are vast compared to the days of five television channels and a handful of records labels, one artist has risen—in terms of talent and the beauty and perfection of her recent output—to an Ellington-ian level: Composer/arranger Maria Schneider." "If you are able to cry over a piece of music. The Thompson Fields will make you cry." "The Maria Schneider Orchestra: Led by Ms. Schneider, a composer and orchestrator of penetrating insight, this group has an ambitiously realized new album – "The Thompson Fields," its first release in eight years – that underscores its stature as the pre-eminent large ensemble of our time." "The Thompson Fields" ***** (five-stars) "Heartening jazz suite that's too good to miss"